Trainee engineers rough it out while getting the best education possible at a N2 construction site. 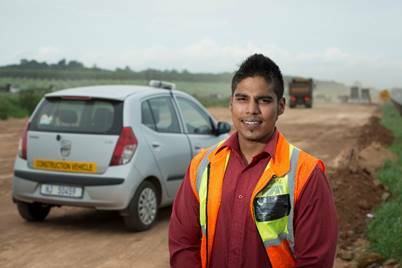 Sumay Maharaj is an assistant resident engineers [AREs] absorbing knowledge from seasoned colleagues on the site of the N2 upgrade between Mthunzini and eMpangeni on the KwaZulu-Natal North Coast. There is no better classroom for a trainee engineer than a rough, dusty construction site full of roaring machinery and an experienced crew hard at work. Thabiso Dladla and Sumay Maharaj are assistant resident engineers [AREs] absorbing knowledge from seasoned colleagues on the site of the N2 upgrade between Mthunzini and eMpangeni on the KwaZulu-Natal North Coast. “We carry out pretty much the same functions as the AREs. We do the inspections, we do quantities, assistant instructions, site instructions and answer any engineering queries we get from the contractor. We basically do what the ARE does,” said Dladla. Maharaj, who started on the project in August 2016, and was previously doing pavement and geometric design in Port Elizabeth at the SANRAL Centre of Excellence, said he has already learned many vital lessons since moving north. Dladla got involved in the project about 10 months after he joined SANRAL’s trainee programme. He is excited to work on the challenging project, which he describes as quite diverse and includes several bridges and culverts. Dladla said: “I’ve been involved in inspections and assisting the contractor where they need clarification on drawings. When it comes to earth works, we also do inspections on the fill materials and sub grade. Maharaj said working on the project is not without its challenges. “I think the main thing is that the design office works differently to the construction site. Sometimes there’s a breakdown in information, especially with drawings – incomplete drawings and things like that. That’s why it’s essential for engineering staff to be on site to answer all these questions,” said Maharaj. He said he would not have come this far had it not been for the support of SANRAL. Maharaj said: “The support from SANRAL has been immense and I’m really grateful for it. Thabiso said the project is projected to end in April 2019 but may extend to June next year.